In the second view I have used more sharpening and contrast with some desaturation. I just cannot resist pushing the envelope with PS. Congratulations on BIP, Phillip. Well deserved for this dreamy, artistic statement. I hope you do not mind that I have also taken the challenge in editing the original. I have used extreme sharpening and color selection in the first version. wow, phillip! congrats on the award! well-deserved, for sure. this is so lovely. i could feel the mist. Fantastic foggy picture. I like composition really much. Thank you very much, Yamil! Much appreciated! You have a diverse and colorful portfolio and I will visit you again when I have more time. For now I just want to show you my appreciation for posting this shot. It’s encouraging that even under bad weather condition you still can come out with great images like this one. Great composition and congratulations for the well deserved BIP. Oh, Michele, thank you so much for your lovely comments! They are much appreciated! Hi Phillip ! I can't believe I also did not comment and congratulate you on this image !! It is beautiful and definitely symbolizes Peace & Tranquility !! Congratulations & Cheers my friend ! Oh, Rocky, thank you so much! I really appreciate you taking the time to leave a comment! Oh, thanks, Barrie! Much appreciated! Oh, James, thank you for taking the time to leave a comment! Great photograph. No modifying from me. I really think you have to discipline yourself with a shot like this as so many adjustments can look as good if a little different. Great stuff. I don't usually use a thin white llne around an image. Possibly because so many of photographs are so dark. I like what the thin white line does to bring out this photograph. I'm less sure of the color of the border. But I'm definitely going to make use of this thin white line. Thanks. Oh, congrats on the well deserved award. A window into another world, my friend. Oh, Sophie, thank you very much for your nice comments! Sophie, I look on photography as a journey of discovery! Since joining UF, I have sought to aim higher, push the boundaries, and get ideas from other photographers - particulary the ones who have achieved a number of awards! That may not work for some, however, that is what has helped me to grow! I have found the projects to be a great way to help me grow as a photographer. I still have a mighty long way to go, however, I am enjoying the ride! By the way, I very much regard myself as a rank amateur! Good luck with your photography! Enjoy the journey! Thank you very much, Aykaan! Thank you very much, Shamsa! Thank you so much, Emgy, for your great comments! I appreciate you taking the time to write them! For me, looking at this image feels like going on a trip to a world made only of beautiful dreams where all the harsh details in life fade away to make place for a big bearable picture. Very soothing and perfect for the project. Oh, Mary, I am so touched by your comments! How honest you are! Thank you so, so much for taking the time to write such detailed and heartfelt comments! I very much appreciate them! nI must say that on first glance, I didn't like this. It just seemed like a faded picture. But, I figured it was worth a closer look as it does have a BIP. This is one that definately grew on me. I have been looking at for a bit and enjoying the peaceful feeling that it creates. The frame is so effective as it provides a window to step through and escape from one's everyday activities. Once inside your picture, there is a calm and gentleness. 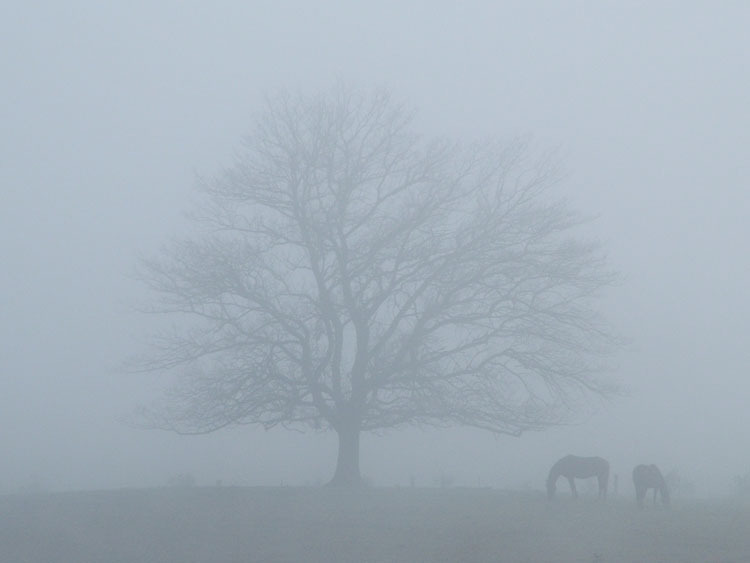 The fogginess represents dreams that need dreaming to bring into clearness. I really like the poeticness (a new word just for you) of this. It is so good that it was featured on the home page. Otherwise, I would have missed enjoying it. Please don't delete it, Phillip. It portrays a different type of picture and that is what I like about UF. There is such a variety and I am learning to appreciate pictures that I never did before. So, for me, your edxperiment was a success. Oh, thanks, Alex! I appreciate you taking the time to leave a comment and offer you opinion! Oh, Doyle, thank you so much! Thank you so much, Shadi, for your lovely comments! Oh, thank you so much, Ron! I really appreciate your nice comments! By the way Phil . . . you can be proud of this award . . . I count only seven worthy images given awards in the last 3,000 images! Very well done! I must say I prefer Star's edited version below: it's just a little darker so you can see more clearly what is being photographed. I enjoy the striking black frame that Star added to bring out the trunk and [horses?] too. But I see why you took the photo; it's a beautiful scene. Makes me wish I were there. So sorry Phil! I've seen this image and have been zipping about not realizing I never commented on it at all! Not so much as a congrats! So . . . uhhhh . . . Congrats!! Wonderful just the way it is Phillip. But it is nice that so many want to advise you. That is what the eye of the beholder is all about. Regards Ron. Oh, Michael, it's all a bit of a fluke! The luck's got to run out soon! Oh, Sean, mate, thank you very much! I appreciate you taking the time to leave a comment! Oh, Hanggan, thank you very much for your comments and suggestion! I like your B&W version! Very nice! Thank you very much, Saeed! Just noticed that we were on line in Sean's profile! I'm sure he will be blown away by the image too, when he next gets a chance to peruse the sight! Wow Phillip, you've done it again! You just seem to go from stength to strength! You obviously should not doubt yourself if this shot is any indication of your self assessment! Beautifully atmospheric, so very tranquil. Very romantic and beautifull.I love it. Thank you very much, Roby! Thank you very much, Ann, for your comments! Oh, thank you so much, Barbara! I really appreciate your comments! Oh, thank you so much, Hesham! I appreciate you taking the time to leave a comment and suggestion. Thank you very much, Mennat-Allah! I appreciate your comments! Oh, thanks, Cathy! I appreciate your comments! Say 'hi' to the gang in Orange. We must catch up, again, soon! See, I told ya ... this is indeed a great shot !!.. and the judges also have agreed now !! fine, great and magic.. just a BIP dear Phil..
Just going through your portfolio, Phil. I didn't realise you'd gotten a BIP for this one too. Congratulations. And you weren't sure about it. Shows how much you know! (lol) Cheers, Ann. Experiment a major success! ;) A very beautiful mood captured here Phil...terrific work. And congrats on BIP! I am very unsure about this one. This was an experiment! Please feel free to criticise the image, if you think it is not right, or just plain bad!!! I will not be offended. That is how I will learn. i've added it to my favorite. My favourite photo, on home page, cool! Now, dear Phillip, aren't you glad you did not delete this? It really deserves this award. For me, a most beautiful poetic dream! Ann's version is the only alternative worth considering...but I love this one!!! Thank you very much, Avi! I appreciate your comments! Feel bad ??? My god !!!.. This is stunning !!!!.. this is an ORIGINAL idea !!.. Thank you very much, Violetta! Your comments are very appreciated! Oh, you are right, Gayle! It is full of noise. I have tried everything to get rid of it (everything that I know about). Like you, I don't know how to do layers, as yet. I seem to learn more about Photoshop and Paintshop each time I use them. I just need to make myself learn how to takle these layers!!!! If I have any success with a B&W version, I'll let you know!!! Thanks for your support and comments! I appreciate it very much! Thanks, again, Gayle, for your comments! At some point in time, I will try, again, to convert this to B&W. Last time I tried it turned out very grainy. The more I tried to get rid of the grain, using Neat Image and other programs, the more 'blurred' the tree became. I'll give it one more go, especially for you!!!!! Thank you very much, again, Mary, for your kind comments! I really like this for its atmosphere and mood. Love the lighting and colour. Like a film to be made or a dream. I like the others put forward too. I can never go "either/or"- I find all the differences fascinating! Don't worry, Dave, I do it all the time! Oh, thanks, Dave, for your comments! Yes, in the original image there is a sheep sitting under the tree. I like this one even better. I was going to ask you if that was some kind of animal next to the tree in your original foggy tree photo. I guess it was. Thanks, Ann, for your comments and suggestions! I appreciate your support and help! Whatever you do Phil, DON'T delete this one! Someone may stumble across it and offer you the best advice ever. I haven't seen this one before. I love it. I did play with it but all I did was hit the auto contrast button in P.S. then faded it back to 60%. I don't think it needs anything else done to it. Love the composition and the border, too. Cheers, Ann. Thank you, Jo, for taking the time to comment! Works well - nice tranquility here. Oh, Kiarang, I appreciate you taking the time to comment! Thank you very much! The fog is too intense and the green tone enhanced it and i think it missed the feeling of this location (IMHO) i preferd more sharpness and details! Oh, Margriet, thank you very much for taking the time to comment! Read my reply to Cathy. You will see that, at the moment, I'm a bit 'anti' this image. I really appreciate you taking the time to comment. Once again, thanks! Don't be surprised to see it deleted! I do that, sometimes, when I really displike a photo. Once again, thanks for your comments! 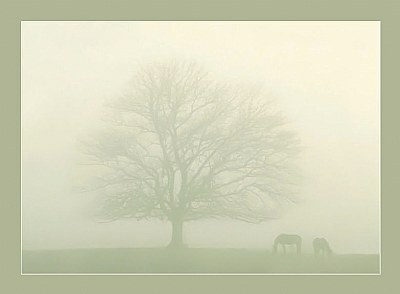 excellent use of the mist to creat a high key landscape. The composition of the animals are perfect. well done. Once again, thanks for your support and comments! I have to admit, I don't like this! Sorry, Ace Star, I do appreciate you taking the time to offer a suggestion. Thank you! Thanks, Ace Star, for your comments! PS I can see no need for changes. With the original, have a look to see which channel the blotches don't show up in and use that as your basis when using the channel mixer. Oh, thanks, Rina, for your comments. Rina, this is the original. You can see how little I had to work with. What do you think? If you try to de-saturate it, it looks all blotchy and grainy. Do you have any suggestions? Well, I don't think it's bad. It's just one result of an experiment. However, I would like to see more pop in the branches, trunk and horses. If the original isn't as light as this, try a subtle blend over it. Just enough to bring out some more detail. I do like the colour though, and the complimenting frame. Try posting this to the CC section too. I'm certain you'll get loads more critical feedback on it. i edit it hope you like my version :) just in few min of editing maybe later i'll work again to make it look much better!